This is the first Katharine Britton title I've ever read and on Goodreads, I gave it 4 stars. 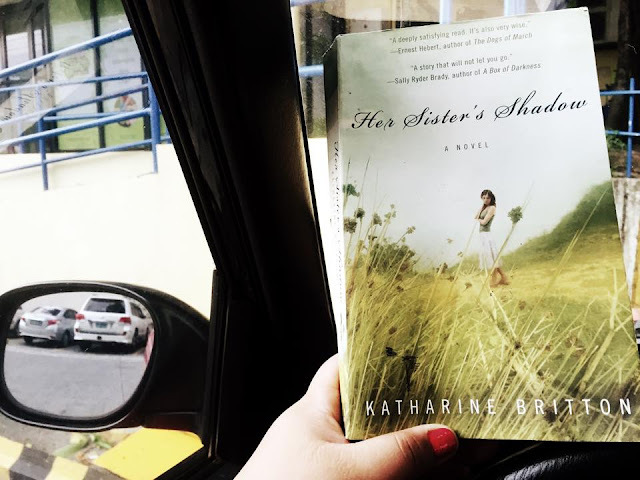 Her Sister's Shadow is the story of two estranged sisters - Lilli an artist based in London, and Bea, who still lived in their family home in Whitehead, Massachusetts. It started off a little too slow for me. It took 6 chapters before the author talked about the death of their youngest sister but you already kinda know that's what was going to happen - but you kept waiting how it would. The sisters were estranged for 40 years. Yes, they talked occasionally, but they managed NOT to have a real relationship. I just couldn't imagine how they could let that happen to them for so long. And they had one more sister! I wonder why she didn't make them kiss and make up. I mean, if you were their sister, wouldn't you do what it takes to get them to resolve things? I understand giving people space and time - but 40 years? Really? Lilli left home and stayed away for so long because, in her mind, she wanted to step away from her eldest sister's shadow. Well, she found out, when they were so old and gray, that it wasn't her sister's shadow she needed to get away from - it was her own. She was so full of anger, and perhaps some guilt too, that she kept herself from being happy. She looked at her eldest sister, she who always seemed to have it all together, and resented her. She felt that she was being controlled. And then betrayed. But all along, she was really just being too selfish. Not everything was about her, and she didn't always have all the facts. She made up her mind anyway. And she kept her distance from her home. Oh how I love their home! The author described it very beautifully. It seemed like a wonderful place to grow up in. I felt so sad that Lilli had wanted to stay so far from it, and how quick she was to decide it had to be sold. To have a home like that! In their family, the responsibility to keep the home and preserve the memories went to the eldest sister. Traditionally, that role goes to the youngest Filipina sibling. Normally, it is the bunso that gets left at home - because everyone else comes of age and marries earlier. Not so with the Niles sisters. In a way, I feel bad for Bea. She only meant well. Perhaps, she was too strong-willed. She also could have said something. She could have taken the first step so Lilli would come around. But I felt worse about Lilli. She grew old, but she didn't change much. Well, we all have a bit of Lilli in us - that bit that refuses to understand other people's perspectives. The lesson there for me is to learn genuine empathy, and to be open to understanding where others are coming from. And that some secrets shouldn't be kept so, at least not for long. I didn't grow up with sisters but I had cousins. They don't always get along with each other, but I don't think they can go a whole year not seeing each other. What about you? Do you have sisters? Can you imagine 40 years of not being in good terms?